There’s nothing quite like sitting in the garden and enjoying the warmth of an open fire. Fire has fascinated man probably since it was “discovered;” flickering flames are magical, warming your body and calming your heart and mind. But let’s face it, making a campfire can be a difficult and messy affair. This is why you should consider a fire pit and here we are with one of the best fire pit reviews online to help you make the right choice from different types of fire pits available today! Fire pits make a wonderful addition to any garden space, providing you with warmth, somewhere to toast marshmallows as well as a focal point when entertaining friends outside or simply just for sitting next to it in your garden. If you’re looking into buying a fire pit but are not quite sure which to choose then you have come to the right place. Here at Stuffoholics, you’ll find the best fire pit reviews written clearly and succinctly all in one place. Read on for our recommendations, whatever your needs, budget and style are. Here at Stuffoholics, we have been reviewing and researching fire pits for years. To date, we have tested more than 30 different fire pits and spent 60 hours researching. We have also compared substantial community-based usage data and personal testing to come up with this short list of our top ten fire pits. We maintain an effective protocol with a view to finding the best quality at a reasonable price. We do not focus on any particular brand, rather we focused on striving to find the best products available on the market using our fact-based research. As a result, we have come up with our top ten fire pits available to but today and provided you with one of the best fire pit reviews so that you can really trust us to help you make up your mind. What Is a Fire Pit and What Does It Do? A fire pit is either a special hole dug into the ground or a dedicated frame in which to burn a fuel in a safe and contained area to prevent the fire from spreading. Today, most fire pits are bought pre-made from a store and can be made from a variety of materials such as metal (cast iron, steel, or copper for example) or pre-cast concrete, clay, stone or brick. Their fuel sources vary, including ones powered by propane, natural gas, and bio-ethanol fire pits or, of course, wood-burning ones. Fire pits give a charming source of heat and if you’re planning on making your dream lawn, it should be the centerpiece. They project a relaxing focus and are available in a wide variety of sizes, shapes and types to suit all gardens and decks: square, rectangular, round and even hexagonal shaped. Furthermore, there are folding portable designs available so you can relocate your fire pit wherever you desire. They can be used simply as light source or for warmth but can also be used with grills or grates to use as a barbeque! Fire pits come in a vast array of styles: propane gas, wood burning, natural gas and gel fuel fire pits. Wood burning fire pits is the closest to a campfire that you can get without building one in your garden. They have the soothing effect of real wood crackling, with warmth and real smoke all while the fire is safely contained. They can come with a grill to cook food on, also can serve as a BBQ for those summer evenings spent with family and friends. Wood burning fire pits can be higher maintenance compared with other kinds of fire pit. The wood fuel can be relatively costly and you may need to chop it yourself not to mention having somewhere dry to store it where it won’t attract too many insects! Propane fire pits are much more convenient than their wood-burning cousins. The flames are still as beautiful but you don’t need to refuel with wood or gel. Propane fire bits are large and are therefore often a much wanted focal point in your garden. They come in some impressive designs too that have cooking capabilities, if so desired, and some can be easily moved from one place to another in your garden. However, there are a couple of drawbacks. Of course, there’s the additional cost of buying the propane but there’s also the risk that you may run out half way through your evening entertainment. Additionally, cooking food over propane does not offer the same quality of flavor as a wood burning model might. If you have the possibility of installing a line into the natural gas pipes then you could consider a natural gas fire pit. These fire pits are permanent fixtures in your yard and as such are not always as flexible as other types. However, they will never run out of fuel mid-way through your evening! Natural gas as a fuel is fairly cheap. However, installing the line in your backyard is definitely not easy and it can be costly depending on where you live. Not to mention the fact that you cannot move them once they are installed. Gel is a clean fuel and does not produce any scent or smoke when it burns. Gel fuel fire pits are very versatile and you can move them pretty much anywhere in your yard. They add intrigue as well as ambiance to your garden. You can even buy logs that are fueled with the gel to create a real fire appearance. You can even get smaller gel fuel fires, ideal for table tops, which can even be brought inside. The drawback of gel fuel fire pits is that they don’t give off as much heat compared to other types of fire pit. What Features Does a Good Fire Pit Have? When buying a fire pit there are several important features that you need to consider, such as the fuel source, size, materials and design, any safety features or weather-resistant coatings and what you want your fire pit to be able to do. Also consider how easy they are to use and to assemble! As mentioned, there are four fuel sources to consider: wood burning, liquid propane, natural gas and gel fuel. As we have said, wood burning is quite cheap in terms of fuel prices and will create bigger, hotter fires too. Though lighting up these fire pits can be challenging and you need larger, dry storage for the wood and they are messier too! Liquid propane takes the advantage of being clean with no ash or embers to sort and they’re easy to control. But, the tank could run out and they can be expensive to run. As above, natural gas is great in terms of its affordability as a fuel but setting it up as a fuel source could set you back mega bucks. Gel fuel is clean too but does not produce as much heat as other sources. Size matters where fire pits are concerned. Firstly, you need to decide what exactly you want from a fire pit and whether or not it’s a permanent fixture or whether it needs to be portable. Fire pits are generally large but there are smaller, movable ones available. Large fire pits hold more fuel, especially wood-burning pits, allowing you to have a bigger fire. But this inevitably means that they take up more space and require much more maintenance. Mid-sized pits are the most common in terms of size as they provide enough heat to keep you warm or cook any food, but still manage to be more convenient in terms of cleaning and maintenance. Smaller fire pits are ideal if you need to move them often and they are often foldable, portable; making them easy to transport and even to take camping with! The material of your fire pit is important in terms of its longevity and durability as well as the overall look it will provide in your yard. Steel is readily available at many price levels and many different levels of quality. Steel is easily molded in too many shapes and so there is a great variety in the design of steel fire pits. However, you should be aware of the likelihood of rusting should you leave your fire pit outside for any length of time. Brick fire pits are also very popular and most of the DIY fire pits are made from brick. They come with steel frames that are solid often with a mesh body and the stone is added to the body via regular masonry techniques. Evidently, brick fire pits are heavy so transporting your fire pit will be trickier to move than pits made from other materials. Copper is a very much sought after material where fire pits are concerned. Copper does not rust and it is a very elegant metal that increases in attractiveness over time due to the copper developing a lovely patina with use. Copper is also easily moldable and has an excellent lifespan. However, due to these amazing features, copper fire pits are very expensive. Cast iron is a common material used in garden furniture and fire pits are no different. It is easy to use, lightweight and inexpensive, hence why it features in so many designs. Cast iron isn’t as strong as wrought iron meaning that cast iron fire pits are easily transportable due to their lighter weight. Stainless steel has the advantage over regular steel that it does not rust. It is another extremely durable material and stays attractive for many years if kept in good conditional. However, stainless steel fire pits are actually quite rare and the styles are not as varied as other materials due to the fact that stainless steel can be quite expensive today. Consider how safe your chosen fire pit is deemed to be. Where will you store the fuel and how easy and safe is it to light? Also, how will you protect any small children from the fire pit whilst it is lit? These are all questions that you need to consider before you purchase a fire pit. As mentioned above, your materials will dictate how weather resistant your fire pit it. Some fire pits have a specially coated finish to protect it from corrosion from snow, rain or even hail. You should most definitely consider where or how you will protect and store your fire pit when purchasing as some metal versions are prone to rust. Fuel also needs to be stored protected from the elements. When selecting your fire pit you need to be thinking carefully about exactly why you want a fire pit in the first place. Is it for decoration, warmth, cooking or for a combination of these reasons? You can buy purpose-built grilling fire pits, serving as a BBQ, or fire pit tables which are more decorative as a source of heat. There are even fire pit art designs where the primary function is to have a stunning attraction in your yard with functionality as an aside. When making a purchase as big as a fire pit, whatever your purpose, you need to think about what comes with it: whether it comes with a fuel supply and everything you need to get started. 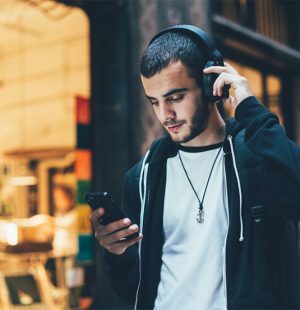 Additional costs need to be factored in when making your all-important purchase. Some fire pits are inevitably easier to set up and use than others. Also, regular maintenance needs to be a consideration as some fire pits need a lot more regular work than others. Who Are Fire Pits For? Fire pits make popular additions to many backyards these days, from amateurs to professional garden designers. Anyone can enjoy a fire pit. In fact with little skill and ordinary tools one can make a fire pit without spending a lots of money. They are great additions to almost any garden. If you enjoy spending time outside, sitting in your garden or on your deck relaxing, chatting and socializing with friends, then a fire pit would be an excellent addition to your yard, allowing for warmth, comfort, and light and even cooking, adding an extra dimension to your relaxation and socializing with family and friends. Similarly, the portable and folding designs are ideal for campers who want an easy set up for a campfire. No more scrambling for firewood in the forest and attempting to build a fire (unless it’s a wood burning one, naturally! ), simply get out your fire pit and load if with fuel and off you go. It really could not be easier. Whether you’re always out and about or looking more at elegance, relaxation and design, a fire pit would make an excellent addition to any garden. Let’s look even more closely at the differences between wood burning and gas-powered fire pits as these two types often flood the fire-pit market, making it hard to choose between the two. Wood burning fire pits are less expensive than the gas varieties. The fire is also hotter, providing a more realistic atmosphere if that’s your thing. You can use them to toast marshmallows and even barbeque. However, you need to have a large source of wood, a dry place to store it and they are tricky to light. They are not as clean as gas models, producing more smoke, smells and, of course, ash and embers. You’ll probably need kindling, fire starters or newspapers to really get it going too. If you’re after authenticity in your fire-making, then this would most definitely be the best choice. Similarly, a wood-burning version is most definitely the best fire pit for heat. Gas-powered fire pits look good. They often have pretend logs or lava rocks which are simply for decoration. The gas-powered ones sometimes have the tank on show, but there are possibilities of choosing designs where the tank is hidden behind a steel or aluminum housing too. They can also be found in other, more decorative designs such as bowls, giving them an altogether more artistic look. They light easily with ignition switches and, as such, are much simpler and cleaner to use than wood burning fire pits. They can also be adjusted in terms of heat and flames unlike their wood-burning counterparts. They can use a lot of gas, however, making them more expensive to use for longer periods of time. We selected our top ten by looking at testing data produced by many volunteers. We also considered the opinions of the experts on fire pits and their choices. Of the 50 or so fire pits available, we have personally tested about 30 of them. It would not be right to say that any of the fire pits that we examined were perfect, rather we have chosen the best ten from the thirty based on our thorough and detailed selection process. Our volunteers looked at the design, build materials, weight, ergonomics, specifications, performances, controls, safety, attachments and accessories as well as the warranty of each product. Based on these focus points, we have put together ten of the best fire pit reviews on the market today. Of all of our tested fire pits, we analyzed 58 important features. You can view our research report in order to help make your choice on the best fire pit to suit your needs and wants. Simply like any of our social media pages in order to view this report and read on for our Top 10 Best Fire Pit Reviews. Before we talk about this fire pit in detail, first let’s look at why we have decided to make this our top choice among all the other wood burning fire pits available. Why is this product Best Wood Burning Fire Pit? This fire pit is affordable, yet packed full of great features. It is powerful, yet reliable and safe, so you can be sure to enjoy warmth, sparks, flames throughout the night. In analyzing the 58 most important features of fire pits, this product contains the maximum number of positive important features that has ensured its presence in the top spot of wood burning fire pits. As you can see in our research report, it is crammed full of significant features. It’s a fantastic addition to any patio, backyard or deck, being extremely durable and stylish with its cutouts creating additional ambiance at night. Despite the abundance of positive features, it is in an affordable price range. In comparing the frequency rating of each of our reviewed products for the last thirty ratings on Amazon, we found that this product receives ratings at a very good rate. For the first ten ratings that we looked at, it received them within a 12 day period. The second ten ratings were received in 27 days and the remaining ten ratings in just 14 days. This fire pit is powerful and safe despite being very economical in terms of initial cost outlay. It has 397 square inches of warmth and viewing as well as a spark screen to protect you and your guests form any stray sparks while they enjoy the flames. The 360° view has a moon and stars cut out too, which is superb to view at night time. This is why we chose it as the best wood burning fire pit. The Landmann 28345 is a large round fire pit with a 23.5-inch high metal fire bowl made from top quality durable steel with a black finish. It has a massive 397 square inches of fire and a 360° viewing capabilities. The steel is design features unique attractive moons and stars cutouts, making it an eye-catching design adding to the entrancing nature of wood-burning fire pits. Put a foosball table beside this in your lawn and get your evening cozy and exciting with friends and family. The cut-outs are particularly striking a night-time, meaning you’ll be the envy of your friends and neighbors! The Landmann 28345 weighs less than 35 pounds meaning it is easily transportable if you fancy a campfire with a difference when you are off on your travels to the beach, camping or a vacation home. As with all wood-burning fire pits, expect high heat output when sitting or standing near this fire pit! The Landmann 28345 comes with an enamel grate for cooking, meaning that it is not just decorative but functional too! For easy and safe transport, the fire pit features a safety ring, which can also double up as a footrest or carrying handle when not in use. It is really easy to assemble, meaning that you can get cracking with your fire soon after you get it out of the box. It has a spark screen, meaning you and your guests won’t get accidentally singed by stray sparks from the crackling wood, and it also comes with a poker and an enamel cooking grill if you fancy giving wood-fire cooking a go. The Fire Pit comes with a 90-day warranty but unfortunately does not come with a cover meaning it can suffer if left outside unprotected. 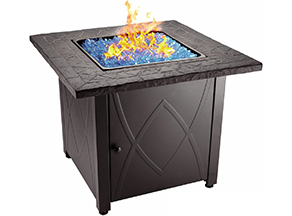 This Landmann fire pit is a unique and attractive design allowing you to be mesmerized by the flames through the moons and stars. It has the possibility of cooking thanks to its included enamel grate and also comes with a poker and spark guard. It’s very affordable and can be purchased from some retailers for under $80. 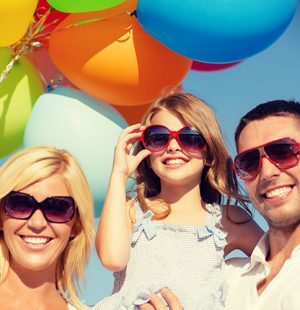 Its safety ring and the 90-day warranty are also attractive to customers, of which there are many! Check out the number of reviews on Amazon; it’s certainly highly rated! We are certain that you will love this fire pit, hence why it occupies our number one top sport for wood burning fire pits, making it the best outdoor fire pit on sale according to Stuffoholics! Why is this product Best Gas Powered Fire Pit? This is our favorites gas powered fire pit. You can enjoy warmth, without all the hassle of having to chop up wood and tidy up afterwards! Perfect! The Endless Summer is our top pick gas-powered fire pit and here is why! From our research report, which you can access through liking one of our social media pages, we have found that is has loads of positive features in a wonderful combination compared with all the other gas powered fire pits that we have tested. It provides a heat output of 30,000 BTUs and provides all the coziness and warmth of a real wood fire without the hassle of chopping up wood cleaning up messy ashes afterward. It has a hidden control panel too for a seamless appearance. Furthermore, it is lightweight in design and ideally suited to the needs of many fire-pit enthusiasts. It has the best frequency of verified ratings on Amazon too! Its first ten ratings were received in just 7 days, the second ten in 15 days and the third ten in thirty days. Additionally, it’s in an affordable price bracket, accessible to all. As such, we have made this our best choice amongst the gas-powered fire pits. 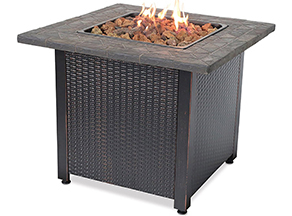 This 30-inch rectangular propane gas powered fire pit is made from weather-resistant steel in an elegant wicker design, hiding the heat source beneath its panels for a sleek and smart look. Furthermore, it has a hidden control panel to make it look even seamless in its design. It has a steel and tile mantel, making it an attractive piece of garden furniture perfect as centerpiece four your outdoor living. The included lava rocks on the top of the unit cleverly enhance the flames too. This unit weighs 86.5lbs, meaning it is a lot heavier than our top choice wood burning fire pit. It is therefore not as portable but nor is it intended to be. This fire pit is more about a focal centerpiece in your backyard that it is about transporting it from one place to another. Powered by a propane gas fuel tank, this fire pit still manages to pack in a lot of power, producing flames with a heat output of 30,000 BTU – as powerful as real wood fire pits! It has all the capabilities of a wood-burning fire pit without any of the hassle and mess associated with wood. There’s no cleaning of ash or embers, no chopping of wood and no difficult starting with firelighters or newspapers. It ignites with a simple push of the button and is extinguished in the same way! The Endless Summer needs no tools for its assembly, making it one of the easiest of our best ten fire pits to assemble. It is one of only two of our reviewed fire pits that is CSA approved. It comes with a 1-year warranty and comes with the lava rocks which perfect the flickering of the flames for a more natural look. This really is a top choice for gas-powered fire pit lovers. It is elegant and stylish in its design and, despite this, it really packs a punch in terms of heat and power too. It is the easiest of all fire pits to use, requiring no tools for assembly and has easy ignition in the form of a concealed control panel button! You really could not get an easier to use fire pit for your money and we really think it is the best gas-powered fire pit on sale today. Why is this product Best for Camping? If you are looking for an authentic outdoor fire experience, then this is the pit for you. 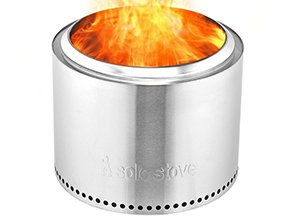 The Solo Stove is perfect for toasting marshmallows over your campfire. 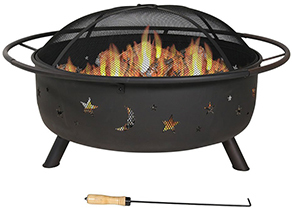 The Super Efficient Solo Stove fire pit is our top choice for campers. Campers want authentic, wood-burning fires for that real, outdoor experience and with this Bonfire it is exactly what you are getting. From our research report, you can see that this fire put has the maximum number of positive features of all of our tested products. This is one of the most unique fire pits out there, pushing the limits with its combustion airflow efficiency while having a minimalist design, ideal for the outdoors with its stainless steel finish. It is nature and environmentally friendly too, meaning you are able to burn any firewood easily. Bonfires are communal fires and this was certainly the brief when this fire pit was designed. Whether you use it to keep warm while camping or to toast your marshmallows, it will add a perfect ambiance to your backyard or campsite. It burns well with almost no smoke and this is why we’ve picked it as our top choice for the campers among us. Additionally, just look at its ratings. It is being rated at a very good rate with its first ten ratings (out of our analyzed 30 last ratings) being received within 18 days, its second ten in 22 days and the final third ten ratings in 19 days. Boasted to be “the world’s most unique fire pit” by its manufacturers, the Solo Stove Fire Pit combines combustion airflow efficacy with a round minimalist design. Its patented design gives you an unrivaled outdoor campfire experience. It is beautiful to look at and created with durable, premium grade 304 and 430 18/8 stainless steel for extra longevity and robustness. It weighs just 20lb making it an extremely portable fire bit, which is what you need when you’re going to be taking it camping! It can be easily stowed away in the trunk of a car or trailer, or easily kept in the garden shed due to its compact size. You really can take it anywhere. There are no extra parts to carry, it is all held together in one easy-to-transport unit. It is powered by wood burning logs with an efficient burn that produces low smoke due to the fire pit’s double wall design. The wall maximizes the air flow with vent holes at the bottom, allowing the oxygen to maintain the fire from underneath. The double all also channels warm oxygen between the walls of the pit, feeding into the fire. This influx of preheated oxygen through the small holes at the top of the firebox cause the secondary combustion. As a result, it almost completely burns the logs meaning there is less mess for you to be having to deal with afterward too. It burns with very little smoke too, meaning that your clothes will be fresher and you won’t spend the evening dodging the smoke in the wind. Customers really like this, making it one of the reasons why it is top rated on Amazon. The main function of this fire pit is most likely to be for warmth if you’re looking at it from a camper’s perspective! However, you can also use it to toast those campfire marshmallows too. It’s perfect to create an ambiance if your garden too, for those long summer evenings entertaining friends or family. There is no assembly with this one! 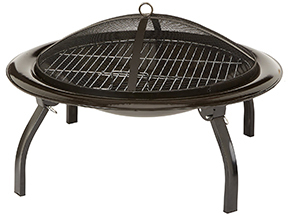 It is a single unit fire pit which is ready to use when you are – even better for the campers! If you’re not into DIY Fire Pits or hate poking around with tools to assemble IKEA, this fire pit is for you. There are no removable parts nor any tool is required at all. Simply load it up with your wood, light it up and enjoy. The fact that this fire pit is portable is one of its main attractions and so to add to this it comes with a heavy-duty carry case too! It’s not a replacement for a real camper’s campfire but it comes in at a very close second and has distinct advantages over a traditional bonfire too. For starters, it leaves no scorch marks or mess on the ground and burns so efficiently that it’s easy to tidy away any ashes afterward too. Due to its double wall construction, it burns cleanly and so is as smokeless as a wood-burning fire can ever really get. It’s definitely our best portable propane fire pit and others think so too: it has an average rating of 4.8 stars on Amazon making it the top-rated fire pit of all of our reviewed products. Choose this fire pit if you are looking for a budget option that you really can’t go wrong with. It has some great features for such a low cost, and is reliable so it won’t break the fast time you use it. As for our best budget buy, you cannot go wrong with the Amazon Basics Portable Folding fire pit. From our research report, you can see that this budget buy has the lowest price of all of our best fire pit reviews. Despite this, it has the topmost number of effective features amongst all of the low-cost products. This wood-burning fire put has a painted steel bowl that is heat-resistant and a fire screen too. There are no tools required to assemble it and it comes with a cooking grate. It has a large variety of features in a great price range. This is why we have picked it as the best budget fire pit around. This Amazon Basics Fire Pit is far from basic! It is a wood-burning fire pit made from painted heat-resistant steel. It is portable and foldable, meaning that you will be able to take it almost anywhere too. You can use it for both cooking and for warmth with it coming equipped with two grates for different purposes. It has four folding legs that neatly fold underneath the base. For a budget buy, it’s a really comprehensive set-up. This fire pit is not only lightweight but it is portable too. It can easily be folded for your convenience and can be stowed easily in its carry bag provided. This means that you even can take it camping with you, as well as having it set up in your backyard for either cooking or just simple ambiance or warmth. The Amazon Basic Fire Pit is a wood-burning fire pit that comes with dual grates, one specifically for the logs. The log grate is placed on the bottom, on top of the fire pit’s painted heat-resistant steel bowl. 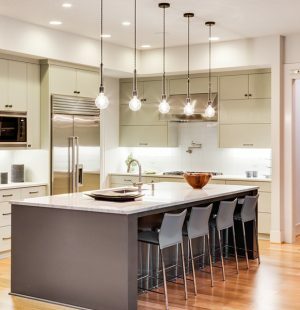 As the wood is raised slightly, space is created underneath which enhances the air flow. This, in turn, creates a better and cleaner burning fire. A second grate which is wider fits higher up the fire bowl creating a useful space for cooking. Grill kebabs, corn on the cob, burgers or whatever takes your fancy! There is even a swinging latched door in the grate that allows you to easily add more fuel to your fire without disturbing your cooking in the process. There is a dome-shaped fire screen included in the price which is heat-resistant and fits neatly over the fire bowl. It allows you to continue to enjoy the view of the fire but also protects you from flying sparks. There is a loop handle on the top of the screen enabling it to be moved easily. There is also a fire tool included which we would recommend you to move the fire screen should you need to. This fire pit, despite being one of the cheapest on sale, is very well designed. It has four stable legs which attach securely to the bowl without the need for tools. It’s pretty much foolproof and almost anyone can easily assemble it in minutes. Furthermore, the curvature of the legs offers stability too, no matter the surface. The legs also fold neatly underneath the fire pit making it even easier to transport and store. 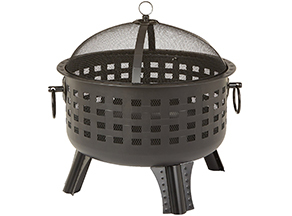 As mentioned, this budget fire pit still packs in some excellent attachments, such as the aforementioned fire screen, two grates and fire tools. Finally, it comes with a durable carrying bag with robust zippers and loop handles and a one year warranty too. For a budget product, you really cannot go wrong with this fire pit. It packs in substantial heat with the functionality of a grill too and comes with everything you need to get started straight out of the box (minus the wood, of course!). If you’re searching for a fire pit that doesn’t cost the earth, then this is definitely a contender. Its portability makes it extremely versatile too. This fire pit is our favorite portable option. It is light, compact and easy to carry around. At only 10lb, it doesn’t need much assembly, so you can take it with you wherever you want your fire pit. From one portable to another! We think this is the best portable that we have reviewed. Why? Because it is full of useful features despite being compact and lightweight. It is the lowest weight of all of our reviewed fire pits at only 10lb. It is a wood-fuelled fire pit that requires no tools for assembly and can be folded for portability. Like our budget buy, it also comes with its own carry bag too, allowing you to take it anywhere. For these reasons, we have made it our number one choice if you’re ‘jonesing’ for a portable pit. This is a well-built piece of kit that is made from painted heat-resistant steels. 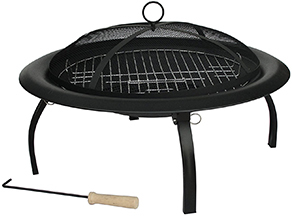 It measures 29” in diameter and gives you the possibility of using it for grilling too! As mentioned in our reasons, you can see that this foldable fire bit weighs the least out of all of our reviewed fire pits coming in at about 10lb. Being foldable is most definitely the key to this model – it folds easily and compactly and can be stowed in the included carry bag meaning that you can pretty much take it anywhere: camping, festivals and obviously, your own small backyard! Like other models mentioned, the raised logs on the log grate allow for the air to circulate resulting in a cleaner and better burning fire. The Fire Sense 29” comes with a wood grate as well as a cooking grate meaning that although you can simply use it for heat and warmth, it can also be used for grilling too, adding to its versatility. The provided fire screen ensures your safety, protecting you from any stray sparks and embers. Furthermore, the fire pit is exceptionally easy to put together and requires no tools at all. Its unique design with foldable legs is what makes it our most portable. You can ‘assemble’ (or unfold!) it anywhere you go, making it ideal for campers or grilling out and about. As mentioned, it comes with its own carry bag and a mesh, heat-resistant fire screen. There are two grates, one for grilling and one wood grate to lift your logs off the bottom of the bowl in order to allow more air to circulate. It also comes with a screen lift tool for your safety. It comes with a one-year limited warranty too. If you’re wanting a portable, not to mention affordable, fire pit that is easy to use, easy to assemble and comes with a ton of positive features then this one’s the one for you. For your money, this really ticks all the boxes. Take it with you camping, hiking and going to festivals too: it’s the perfect addition to your camper’s kit, allowing you to create a bonfire in minutes and even cook your dinner. If you’re into hunting in the woods and know how to skin an animal, you can enjoy BBQ of fresh meat with it. Sounds amazing, isn’t it? This fire pit looks good and is foolproof. Not only is it stylish, but it has lots of features you will find useful. On top of that it's also affordable! Great! 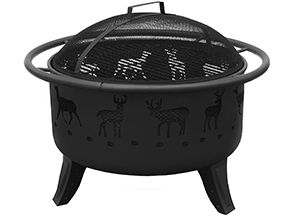 Made from the same durable metal as our top pick, this Landmann features unique deer track cutouts 360° around the fire pit. The bowl measures 23.5” across and is constructed with long-lasting cold-rolled steel with a heat-resistant black finish. It also has decorative sculpted legs, which provide strong support and stability. There is a full-diameter safety ring that is one inch thick, which can also be used a rest for your feet or a carry handle when transporting your fire pit. It weighs just 24.2 pounds and measures 29.5 inches in diameter. It is easy to handle thanks to the aforementioned safety ring which can be used to carry it from one place to another. 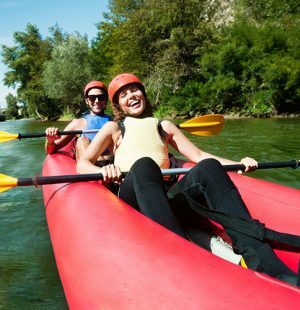 Its lightweight design also means that it’s not too cumbersome to take to the beach or to take camping like products made from wrought or cast iron would be. This wood-burning fire put as a fire bowl that has an impressive 397 square inches of fire surface area. Given that includes a fire screen and a footrest, this fire pit’s principal use would most likely be for warmth and ambiance. However, it does come with a grate for grilling and a poker, allowing you to tend to the fire and cook your supper should you desire. As mentioned, this Landmann grill is one of only a couple to feature a safety ring as well as a fire screen, drastically reducing your risk of being hit by a flying spark or ember. The manufacturers boast that it is easy to assemble too. 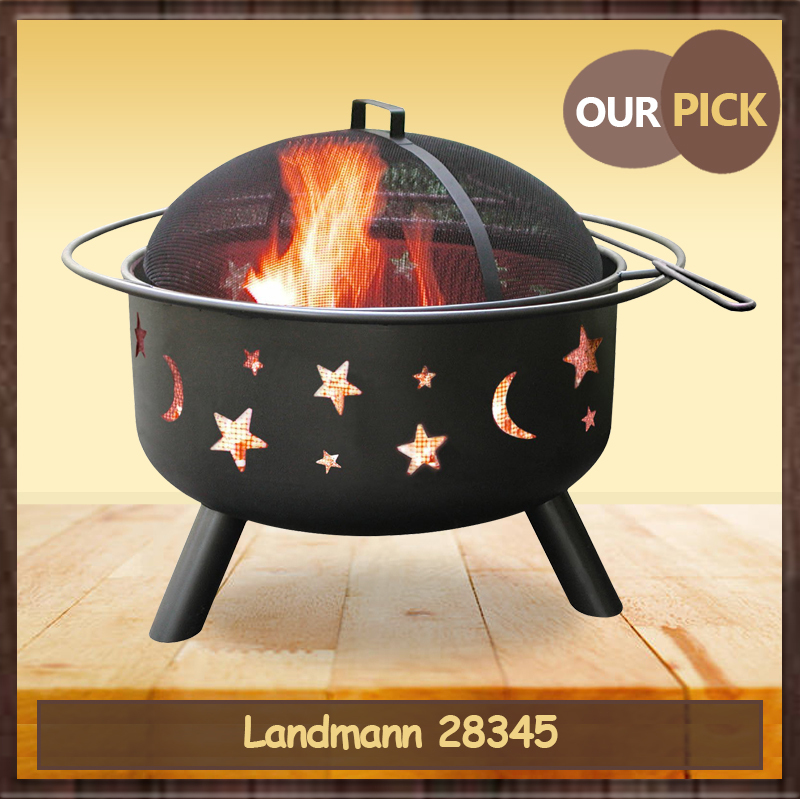 The Landmann 23192 comes with a poker, mesh fire screen and grilling grate. Unfortunately, we have not been able to find out what the warranty of this product is. Another attractive Landmann design here, this time with deer tracks and deer. It’s a beautiful looking fire pit, mesmerizing to the user but with great functionality too. It’s affordable in price with very good ratings on Amazon. What sets it apart from the others in our list is its design. It has many similarities with our top pick and is slightly lighter in weight. There are not as many reviews of sales but the reviews that it does have are very good indeed. This is a very good Landmann choice that would look great on your deck if moons and stars are not your thing! This fire pit is neatly hidden into a table design, so is great for a garden and blending in with your outdoor furniture. The Blue Rhino fire pit is a rectangular propane-powered fire pit designed for outside use, offering you comfort, warmth and ambiance all year round. It has a steel table deign which looks great, with a sophisticated appearance including lava rocks or copper or blue fire glass rocks to enhance the look of the flickering flames. It measures 30 inches and is 24 inches high with decorative rectangular side panels to hide the propane tank beneath the fire pit. Weighing 70lb, this is not the sort of fire pit that is easily movable. As such, you shouldn’t be considering it as a portable fire pit for your camping expeditions. It is most certainly a long-standing garden feature as opposed to being a portable. Being a propane gas powered fire pit means that it probably kicks out a little less heat than its wood-burning counterparts. But, as we have explained above, propane is very clean to burn meaning that you won’t have the ash and embers to clear up after the party’s over! No need to spend time prepping any wood or fuel either. 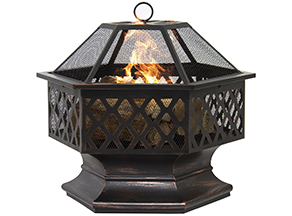 This fire pit primarily for warmth and ambiance, adding elegance and heat to any backyard. It is not a suitable design for cooking nor can it be easily moved. If these are things which you require then this probably is not the fire pit for you. However, as a decorative fire it fits the bill perfectly. You can even choose between fire rocks and copper or blue fire stones to fan your flames. The fire pit features a special safety valve as well as having an easy-to-start ignition switch – no fiddling with firelighters or matches here! 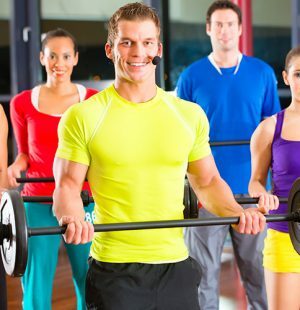 It is quick and easy to get going! Unfortunately, it is a little awkward and time-consuming to put together. But, once you have, it’s there for the duration. The Blue Rhino comes with a decent one-year limited warranty as well as a cover to protect it from the elements. As mentioned, it comes with your choice of rocks too. The Blue Rhino fire pit gives you an easy and soothing fire which is perfect for any outside space if you want warmth and a cozy feel without the hassle of having to tend to a real wood fire (nor the subsequent clean up afterward either!). It’s beautiful and atmospheric to boot in a wonderful rectangular design. This hex shaped fire pit boasts a really elegant and unique design, that will not only serve as a great fire pit, but also looks good as a piece of art. The Best Choice Products Bronze-finish Hex Shaped fire pit is unique in its shape and design – what a difference to the average square or rectangular designs out there! As mentioned, this wood-burning fire pit has a lovely distressed bronze finish and is made from hard-wearing premium steel in a rustic lattice pattern. It has a large, deep bowl in a hexagonal shape with a pedestal base which would easily compliment any existing set of patio or garden furniture already in your backyard. Furthermore, it is lightweight too meaning that you can easily change its location in your garden or transport it further afield if you are going on an epic camping adventure for example. As mentioned, despite the durability and robustness of its steel construction, this fire pit is actually quite light in weight, meaning that it is easy to move and handle. It weighs 22.6 pounds. As a large, wood-burning fire pit, it is capable of producing long-lasting, powerful fires. The bronzed finish adds to its beauty and elegance when the reflection of the flames catches the shimmer of the metal. The open grill sides allow the heat to radiate in all directions. It performs well in the garden, ensuring that you have many long evenings of warmth, ambiance and conversation. Principally, this fire pit is used for decoration and warmth. It does not have any attachments for cooking so we would not recommend that you try and cook your dinner on it, although a few campfire marshmallows are, of course, perfectly fine! The fire-retardant screen fits well onto the fire bowl, ensuring that you are protected from any stray embers that might decide to shoot out of the flames. 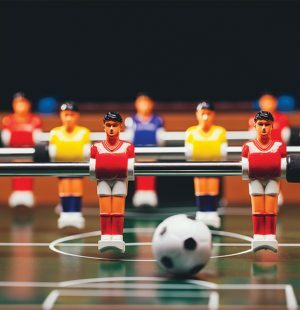 It is also easy to assemble, with some users stating that it was a less-than-five-minute job! It comes with the fire screen and a fire-resistant spark screen to keep those stray embers away from you and your guests. It comes with a 60-day warranty, which is rather short compared to some warranties that we have seen. This fire pit is actually marketed as an outdoor fireplace – and that’s exactly what you get! It’s elegant and hot, producing an atmospheric flame in a beautiful design that would be the envy of your neighbors. It’s lightweight enough to be portable but sturdy and durable enough to stand the test of time! If you’re looking to cook outdoors on an open flame then, sadly, this one probably isn’t for you. Unless you’d like marshmallows for your dinner, of course! It has 9 of the most positive features in our analysis, as you can see if you take a look at our report. The Amazon Basics Steel Lattice fire pit is a wood-burning pit that has an attractive design and comes in a very affordable price range. It has a large 23.5-inch bowl and is made from robust and durable steel. It offers 360° fire viewing and is ideal for any decking, garden or patio. It is hard-wearing with a black, sleek finish in a cauldron shape with lattice sides. Weighing in at 22lb, it is lightweight despite its durability. This means that you can move it around easily in your garden or even take it with you if you want to have a different kind of camping or traveling experience. It very easy to maneuver thanks to the side handles. Thanks to its 360° design, it provides powerful heat for everyone in its surround. It creates the perfect ambiance and intrigue due to its cut out designed sides and is the perfect focal point for any garden gathering. This fire-pit is designed primarily as a focal point and, as such, is not particularly suitable for grilling (unless all you want it to be able to toast marshmallows, in which case it’s perfect!). It’s easy to assemble and comes with a spark screen to stop any stray embers for scorching its surround and your guests! It has three angled legs to ensure its stability. It comes with a fire poker for safe and easy stoking of the fire and comes with the aforementioned spark screen for safety. Comes with an Amazon Basics 1 year limited warranty. This affordable fire pit by Amazon Basics comes with 4 stars from Amazon, so it is hardly ‘basic’! It would make a great addition to any garden or yard and is an attractive design with 360° heat. It has a generous sized fire bowl which allows for larger logs and subsequently larger fires! It’s a real candidate for your heat source for entertaining and hence why it’s in our top ten fire pits on sale today. 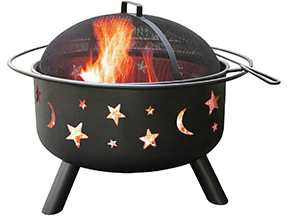 This large Sunnydaze wood-burning fire pit adds a unique and uplifting charm to any patio or backyard with its cosmic moon and stars design. Built from steel, it is pained in aged “rustic patina” heat-resistant paint, fitting in with current garden décor trends. Due to its large size, it provides ample space for masses of logs, allowing you to create powerful and long-lasting fires safely. Weighing 36lbs, it is heavier than some of our other reviewed products but this just adds to its stability. It is still able to be moved around easily should you decide to change its location or store it elsewhere. The outer rim aids you when you want to move it too. Having such a large sized fire bowl means that this is a top performer in the power and heat stakes. The stars and moons cutouts help the fire burn well, allowing oxygen to circulate continuously in the bowl. This beautiful fire pit is ideal for hosting gatherings in your garden on those cooler evenings. Simply light your fire and watch your guests be mesmerized by the crackling flames. It does not come with any capabilities for grilling, however. But, you can buy a grilling grate separately and start cooking with it. This fire pit also has a spark screen and in-built grate strips so that your wood is held in place. It is easily assembled by attaching the three legs and outer rim. The outer rim also functions as a rest for the poker too. It comes with a spark screen and poker/wood lifting tool. It also has a 1-year manufacturer’s warranty. Steel is reportedly a little thin, measuring at 0.75mm. Your family and friends will really enjoy gathering around this cosmic design fire pit by Sunnydaze. It is large and suitable for any backyard or garden, providing you with a powerful wood fire to enjoy your evenings relaxing. It’s easy to assemble and to clean too. It is, however, on the more expensive side of the products on sale, hence its place in our top ten. 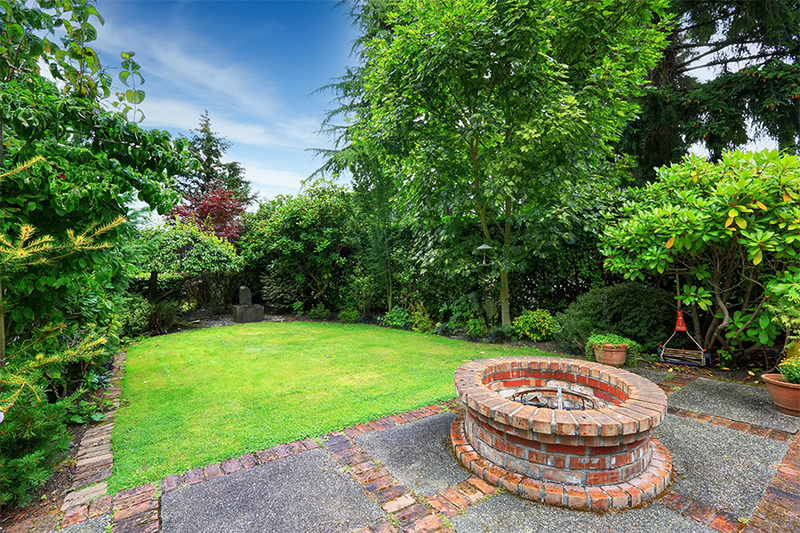 Before you begin to use a fire pit, you should be aware of how you will take care of one. Ideally, it is better to do this research before you purchase a fire pit so that you are able to know what your expectations are in terms of how to care of your chosen pit before you purchase. For instance, cast iron fire pits would require different maintenance to stainless steel! After you’ve read all of our best fire pits reviews, I am sure that you are now very familiar with the different types and have some idea on how to clean and maintain them. To help you out a little more, read on for our care and maintenance tips. Firstly, before you use your fire pit, ensure you read the manufacturer’s instructions provided as different fire pits often require different methods of care and maintenance. If your fire pit is a wood-burning one then ensure that you use the spark cover, if it comes with one, as it will protect your environment as well as you and your guests from flying embers and hot sparks. You should always use a fire poker, if you have one, to adjust the fire too. If you have a propane gas fire pit, you should check the gas fittings as well as the gas tank before you embark upon using it. Ensure that any ash or leftovers are cleaned away on a regular basis as this will allow your fire to burn better. Of course, it should go without saying that you should not attempt to move your fire pit while it is still hot. You should also take care as to where you position the fire pit to begin with so that it doesn’t accidentally damage or set fire to wooden constructions or nearby trees or spark on to your deck. You should ensure that it is never left unattended and do not attempt to overfill it as this could be dangerous. For copper based fire pits, you should add a layer of sand in the bottom as this will protect its surface from extreme temperatures and will allow the copper to maintain its attractive and clean appearance. And for any type of fire pit, make sure to cover it properly with pit covers. If your fire pit doesn’t come with a cover, its easy as pie making a fire pit cover by yourself. Fire pits are stunning additions to any garden or backyard. They add ambiance, charm and an intrigue to any outdoor gathering. They can change a normal garden party into something else, some even into a barbeque. It all depends exactly what it is that you want from your fire pit. Simple elegance and warmth? Opt for a standard wood-burning or gas-powered pit! Grilling and portability? Then there are those options too. If you’re more concerned with the look of it then we have covered round, rectangular, square and even hexagonal options! If it comes down to a limited budget then you still have choices available too. Some of our reviewed products also fall into the budget category even if they’re not our number one budget choice. Now that you have read our top 10 best fire pit reviews, you might have a better idea of what it is exactly that you’re looking for in a fire pit. Once you have made those important decisions such as wood or gas, portable or not, we hope that you find selecting your perfect pit easy with our help. Remember, should you want more details on our research then we have our research report available for your perusal (remember to like any of Stuffoholics’s social media pages to gain access). We hope you are soon enjoying the warmth and atmosphere that only a fire pit can provide.